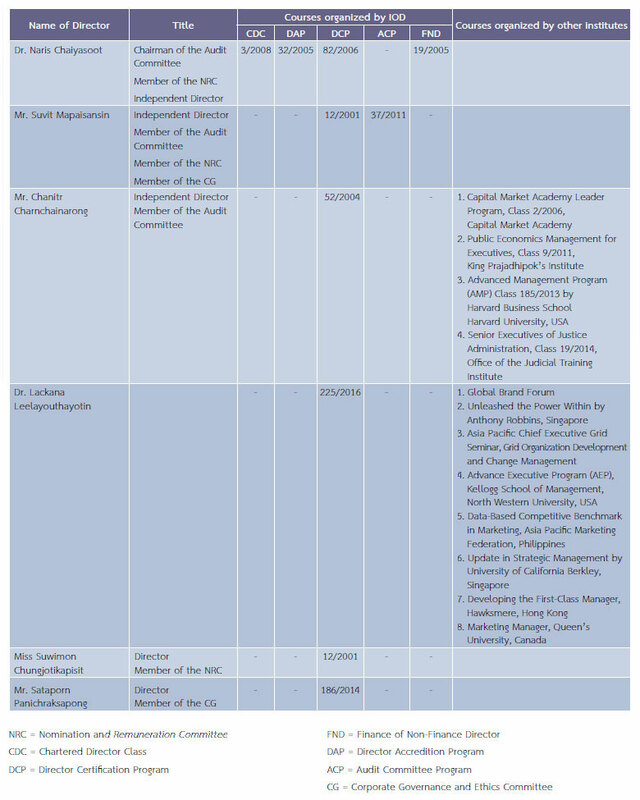 The Board of Directors determines the board composition that fits with the Company’s business size, whereby it is set to be composed of at least 5 members, not less than 1/2 of the directors must reside in Thailand and at least one of whom must be experienced in accounting and finance field. Of the total number of board members, at least 1/3 and no fewer than 3 persons must be independent directors. The Board of Directors must be partially composed of non-executive directors so as to ensure checks and balances against the executive directors and a minimum of 1/3 of the total board members must be independent directors. Meeting the qualifications and not possessing the prohibited characteristics prescribed in the Public Limited Companies Act B.E. 2535 or other related laws, as well as the regulations of the SET and the SEC and the Company’s Articles of Association. Being an expert with knowledge, capability and experience that are beneficial to the Company’s operation. Having a leadership skill, vision and independent decision-making ability to ensure the maximum benefit to the Company and the shareholders. Being responsible to serve as the director and able to spare full time to perform the duty, assuming accountability to shareholders and duty of care and protecting the Company’s interests. Performing duties with integrity, honesty, ethics and adherence to laws, good corporate governance principles and code of business conduct. Holding shares of not exceeding 1% of total voting shares of the Company, its parent company, its subsidiaries, its associated companies, its major shareholders, or its controlling persons, including shares held by related parties. Not being or have ever been an executive director, employee, staff, corporate advisor receiving a regular salary, or a controlling person of the Company, its parent company, its subsidiaries, its associated companies, its samelevel subsidiaries, its major shareholders, or its controlling persons unless the foregoing status has ended for more than 2 years prior to being appointed as Independent Director. Such prohibitions exclude government officer or advisor to any government agency who is major shareholder or controlling person of the Company. Not being a person related by blood line or by law in terms of father, mother, spouse, sibling and child, including spouse of the children, of other directors, management, major shareholders, controlling persons, or persons to be nominated as directors, management or controlling persons of the Company or its subsidiaries. Not being or have ever been an auditor of the Company, its parent company, its subsidiaries, its associated companies, its major shareholders, or its controlling persons and is not a significant shareholder, a controlling person, or a partner of an audit firm which employs auditors of the Company, its parent company, its subsidiaries, its associated companies, its major shareholders, or its controlling persons unless the foregoing relationship has ended for more than 2 years prior to being appointed as Independent Director. Not being or have had a business relationship with the Company, its parent company, its subsidiaries, its associated companies, its major shareholders, or its controlling persons, in the manner that may interfere with his/her independent judgement, or is not or has not ever been a significant shareholder or a controlling person of any person having business relationship with the Company, its parent company, its subsidiaries, its associated companies, its major shareholders, or its controlling persons unless the foregoing relationship has ended for more than 2 years prior to being appointed as Independent Director. The term “business relationship” aforementioned includes any normal business transaction, rental or lease of immovable property, transaction relating to assets or services, grant or receipt of financial assistance through receiving or extending loans, guarantee, providing assets as collateral, including any other similar actions which result in the Company or his counterparty being subject to indebtedness payable to the other party in the amount of 3% or more of the net tangible assets of the Company or 20 million baht or more, whichever is lower. Not being or have ever been any professional advisor including legal or financial advisor who receives an annual service fee exceeding 2 million baht from the Company, its parent company, its subsidiaries, its associated companies, its major shareholders, or its controlling persons and is not a significant shareholder, a controlling person, or a partner of the professional advisor unless the foregoing relationship has ended for more than 2 years prior to being appointed as Independent Director. Not being a director representing Board member of the Company’s, its major shareholders, or a shareholder who is related to the Company’s major shareholders. Does not own/run any business similar to or material competing with the Company or its subsidiaries, or not being a significant partner in any partnership, executive director, employee, staff, advisor receiving regular salary, or holds more than 1% of total voting shares of the company similar to or material competing with the Company or its subsidiaries. Have no any other characteristics which make him/her incapable of expressing independent opinions with regard to the Company’s business. After being appointed, Independent Director may be authorized by the Board of Directors to make a collective decision to execute business of the Company, its parent company, its subsidiaries, its associated companies, its same-level subsidiaries, its major shareholders, or its controlling persons. Any person being appointed as Independent Director of the Company may be a person who has or has had a business relationship, or may be a professional advisor receiving amount exceeding those specified in item 5 or 6 in case the Board of Directors has duly considered that relationship will not affect the ability to perform duties and express independent opinions. Directors shall hold the terms as stipulated in the Public Limited Companies Act B.E. 2535 and the Company’s Articles of Association, which reads “At each annual general meeting of shareholders, 1/3 of the directors, or if the number is not a multiple of 3, then the number nearest to 1/3, must retire from office. The directors who have been the longest in office shall retire first. The retiring directors may be re-elected.” The Nomination and Remuneration Committee will select and nominate qualified persons to be directors to the Board of Directors before seeking approval from the shareholders’ meeting. The Board of Directors has stipulated that members of the Audit Committee, Nomination and Remuneration Committee, Risk Management Committee and Corporate Governance and Ethics Committee shall each have a term of 3 years and may be re-appointed as deemed fit by the Board of Directors. The Board of Directors has stipulated that all incoming directors must attend an orientation program. The Company Secretary is assigned to provide them with documents and information relevant to the directors’ duties such as Directors Guidelines, Corporate Governance and Ethics Manual, Articles of Association, Capital Structure, Shareholder Structure, Operating Results, Related Laws, Best Practices for Directors, relevant rules and regulations, director training courses and other information pertaining to the Company’s business in order to enhance the new directors’ knowledge and understanding of the Company’s operations in all respects. Office of Corporate Secretary shall arrange new company’s directors a company visit together with company presentation to create their better understanding about the Company’s business operation. The Board of Directors encourages, supports and provides convenience for all parties concerned with the Company’s corporate governance processes such as directors, sub-committee members, management, Company Secretary, Investor Relations Department, Accounting Department, etc. to participate in training and seminar programs or activities arranged by Thai Institute of Directors (IOD), the SET, the SEC, Thai Listed Companies Association, Thai Investors Association or other independent organizations on a regular and continuous basis in a bid to enhance their knowledge and operational efficiency. The Board of Directors has assigned the Company Secretary to coordinate with the directors and management and inform them of details about the said training courses. The Board of Directors announced the Board meeting’s schedule in advance for 1 entire year, to the directors and the relevant parties, requiring that a regular meeting be arranged at least once every quarter (4 times a year), with a special session meeting allowed to be convened as deemed necessary. Agenda items are also pre-determined and are clearly divided into categories such as issues for information, issues for approval and issues for consideration. The Company screens the proposed items to make certain that all crucial issues are included in the agenda, whereas all board members are entitled to propose agenda items independently. The Company Secretary submits an invitation letter complete with the meeting agenda and accompanied by related documents to all board members at least 7 days ahead of the meeting date to allow the board members sufficient time to consider the issues. Where it is deemed essential or urgent, the meeting request can be notified by other method or the meeting can be arranged sooner. A meeting usually takes 1-2 hours. The Company Secretary takes the minutes of the meeting. To promote the Board of Directors’ performance, the Office of Corporate Secretary determined criteria and forms for the completeness, adequacy and suitability of information submitted to the Board of Directors, aiming to enable the Board of Directors’ meetings to proceed smoothly, quickly and efficiently, in accordance with relevant laws and regulations, for all units concerned to use as reference and standards in preparing information before submitting to the Office of Corporate Secretary for compiling as a proposal to each Board of Directors’ meeting. In each meeting, the Chairman allows each director to express his/her opinions freely and allocates time appropriately and efficiently. In case of a director having a stake in a matter being considered, the director shall inform the meeting of such stake and shall not participate in discussing the matter and not exercise the voting right on the matter. At least 2/3 of the total number of directors shall be presented to form a quorum at the time of the Board passing a resolution. The Board of Directors has a policy to encourage each board member to attend the board meeting consistently, with an average participation of at least 80% of total number of board meetings held in each year. The total number of meetings held and attendance by each member of the Board of Directors and board committees are disclosed in the Company’s annual registration statement (Form 56-1) and annual report. Besides, the Board of Directors has a policy to encourage non-executive directors, independent directors and members of the Audit Committee to hold meetings among themselves as deemed fit in order to discuss about any crucial management issues without the presence of the management. In 2017, the Audit Committee members, held 1 meeting with the external auditor without the presence of the management on February 27th, 2017. The Board of Directors requires that duties be clearly segregated for the purpose of power distribution in decision making and directing, with balance and review in management. This has been continuously improved for suitability and coverage of the Company’s activities, in line with changes in the notification or requirements of regulatory agencies, with management power being put under the Corporate Authorization Index for information and action by parties concerned. As a strong advocate of good corporate governance, the Board of Directors has segregated the positions, powers and duties of Chairman of the Board and the Group Chief Executive Officer in conformity with the Corporate Authorization Index which was duly approved by the Board of Directors, so as to ensure the Board of Directors’ independent checks and balances against the management. The Board of Directors ensures that it has a proper board composition and a definite segregation of roles, duties and responsibilities between the Board of Directors and the management. All board members have the freedom of conveying their opinions on the Company’s operation with integrity and in the best interest of the Company and without being influenced by any party. They also are held accountable for performing duty in accordance with relevant laws, the Company’s Articles of Association and resolutions of the Board of Directors’ meeting and the shareholders’ meeting. 1) Each director is allowed to hold directorship in other listed companies not more than 5 listed companies, inclusive of the Company, to ensure the directors’ efficiency and sufficient allocation of time to serve on the Company’s Board of Directors. 2) Directors should avoid holding directorship in any other listed company that could create a conflict of interest with the Company and in performing their duty as the Company’s director. The Board of Directors allows the Group Chief Executive Officer and top executives to take directorship in other companies and most of them are appointed as directors of companies in the Group; in all it is of benefit to the Company, not affecting the performance of their respective duties and responsibilities. The Board of Directors regularly conducts a yearly Board and Director self-assessment to be a framework to monitor the performance of the duties of the Board, including reconsider processing commentaries on various issues related to the operations of the Company, and duties of the Board during the past year, a summary of the Company Secretary, and present the findings to the Board of Directors to be used to edit and enhance performance. The Board self-assessment is divided into 5 rankings: 4 = Excellent, 3 = Very Good, 2 = Good, 1 = Unfavourable, 0 = Need Improvement. In 2017, the Board of Directors required that self-assessment apply to all Sub-committees, namely, the Audit Committee, Risk Management Committee, Corporate Governance and Ethics Committee and Nomination and Remuneration Committee; formerly this applied to only the Audit Committee. The self assessment results were reported to the Board of Directors on a yearly basis for review of the committees’ performance, including opinions on issues related to their performance of duties during the past year, with an aim to make improvements and enhance work efficiencies. The performance assessment forms were determined according to each committee’s scope of duties and responsibilities. For the Audit Committee, the performance assessment was also based on the Best Practice Guidelines for Audit Committee, developed by the SET, the Thai Institute of Directors (IOD) and companies with good ratings on good corporate governance, where applicable to the Company. The Board of Directors has assigned the Nomination and Remuneration Committee to evaluated the performance of the top executive in the organization’s structure (Group CEO) on a yearly basis, for use as a guide in determining the top executive’s remuneration and submit the result of the evaluation to a meeting of the Board of Directors for acknowledgement and approval. In 2012, the Nomination and Remuneration Committee agreed to improve the evaluation form of the performance of Group CEO to suit the current situation, based on the evaluation form of the performance of the top executive of the Corporate Governance Center, The Stock Exchange of Thailand. The Group Chief Executive Officer evaluation is divided into 5 rankings: 4 = Performed excellently, 3 = Performed very well, 2 = Performed reasonably, 1 = Performed partially, 0 = Not yet performed. The Board of Directors sees the importance and need to support the development of a succession plan for the top executive, Chief Executive Officer and/or other key management positions, which is part of the Company’s human resources management strategy. The Development planning of talented personnel is aimed to cope with any unexpected incapability or vacancy of those key positions to ensure uninterrupted operation.